Two years ago, the Consumer Products Safety Commission (CPSP) named basketball the most dangerous sport because of the amount of injuries incurred, which makes hazards in basketball an issue of which to take note. Hazards in football are often some things people think of when sports safety is discussed. However, CPSP noted that cycling and basketball result in more youth athlete injuries than any other sports. Basketball was slightly more likely to harm someone than cycling with a total of 1.6 million injuries treated in 2004. However, not all athletes report all of their injuries so an accurate number based on hazards in basketball is likely larger. Overall ankle sprains have been noted as the number one basketball injury. Safety.com reports that basketball players tend to injure their hands, ankles and knees most frequently but that injuries are not limited to these areas of the body. Overuse injuries in basketball relate to injuries that occur due to constant stress on an area of the body. This is where many knee and ankle injuries happen - the body is worn out and then one small fall can seriously hurt a less protected (and tired) area. Jumper's knee, technically called patellar tendonitis, is one sign that care is needed. Jumper's knee is characterized by a usually constant throbbing or painful feeling in the area below the knee. Sometimes in sports people try to play through pain which is the perfect way to make a potentially bad injury much worse. Another overuse injury is Achilles tendonitis, where the leg tendon connects the calf to the heel and it can tear. There are tons of overuse injury issues in basketball but another one to watch for is pain in the rotator cuff muscles. The rotator cuff is basically the shoulder and repetitive tossing of the ball into the overhead hoop can cause overuse and pain. Overuse issues can lead to traumatic basketball injuries, which can occur all on their own - like a bad surprise. Head concussion or broken wrists are good examples. Anything that can be categorized as a sudden forceful injury is traumatic. 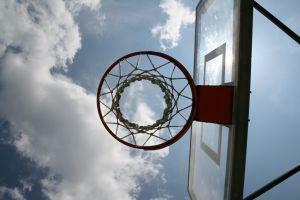 Ankle sprains and jammed fingers are common hazards in basketball that are traumatic as well. Jammed fingers may sound like a small issue but can result in broken bones and sometimes long-term problems. While not as common; other injuries besides overuse and traumatic injuries do occur so it's good to be aware. Forceful bodily collisions with other players that may result in various injuries. Forceful bodily collisions with equipment such as playing surface, walls, balls, benches and doorways. There is also a risk when any other items such as coolers or personal items like backpacks are close to or on the playing area (such as the gym floor). Loss of teeth is far less common but is still a risk and mouth guards can help protect against this issue. Cuts and abrasions can occur. Most often these are easily treated problems but can leave players open to the risk of blood and fluid exposure from other players. Youth overall are prone to basketball injuries - some theorize that this may be due to inadequate training for youth sports. Women and girls, especially adolescents girls, have been noted to be two to eight times more likely to obtain knee injuries such as torn ligaments. Torn ligaments are no laughing matter either. Ligaments are the rope-like tissues that connect structures in our bodies such as the anterior cruciate ligament which connects the shin bone to the thigh bone, a ligament likely to be hurt while playing basketball. While there are non-surgical repairs for certain ligament issues, many injuries will result in surgery. A badly torn ligament can disable a player for months or a lifetime. If you play sports it's almost certain that an injury will at some point occur; especially if that sport is basketball. However, there are some ways to reduce the chances that you'll be seriously injured during practice or a game. Before playing any sport have a complete physical. Maintain the proper weight for your size - this cuts down on injuries where jumping and landing on your weight is involved. Wear proper protective gear and that includes being smart about sports vision safety. Along with protective gear be sure to wear proper court shoes. Maintain a clean playing area. Such as keeping backpacks, jackets, drinks and food off of the court to avoid creating trip and slip hazards. Warming up before basketball play and cooling down afterwards are two of the best ways to prevent injury. Follow the rules of the game. Be sure that if you or your child plays that other team members are forced to follow the rules - if pushing, shoving, and other harmful acts are allowed this is not the right team to play with. Keep it fun. Keeping basketball fun allows for a good time and not a high pressure and stressful time. Make sure your child's school provides safe outdoor school games - basketball at recess can be just as dangerous as basketball on a team. If you're in pain stop playing. If you get hurt stop playing. If you feel too tired or stressed stop playing. Most injuries can be treated much more efficiently in the early stages. There is never a good reason to play after an injury has occurred. Continuing to play when your body is damaged or hurt can result in life-long injuries. The best advice is that at the first sign of injury seek medical attention and rest. National Youth Sports Safety Foundation: Offers fact sheets and plenty of ideas about basketball (and other youth sports) safety. Girls Can Jump offers an amazing array of ideas for basketball playing females. Female bodies are different than male bodies and require unique training, exercises, and care to stay healthy while playing. This site offers suggestions about how to do that.